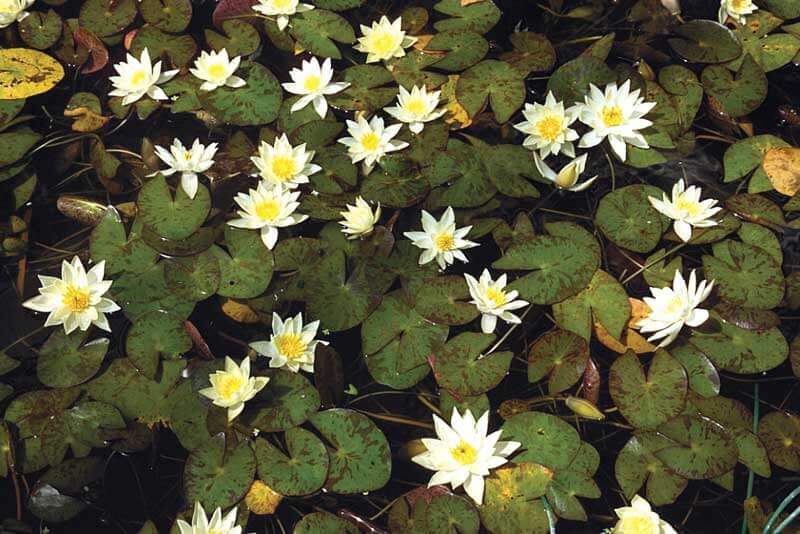 Choosing plants for your pond is similar to selecting plants for your flower bed. You will need to consider the height, condition and color, as well as the species. The most beautiful ponds are those which feature a diverse selection of pond plants in various colors and textures. When selecting colors, it is important to think about the type of light the pond gets. For instance, orange, white or yellow light can be used to effectively brighten areas which are shady, while violet or blue light can reduce the intensity of rays from the sun. Using lots of green foliage is highly recommended as it will produce a natural space which is calm and soothing. Aquatic plants come in a variety of colors such as yellow, red and even purple, so you have a lot of options you can experiment with. A common mistake that is made by novice pond owners is not considering how large their pond plants will become. When choosing plants, it is important to think about the size they’ll reach at maturity to ensure you have sufficient space to accommodate their growth. It is also a necessity for plants to be properly grouped together. Any good interior decorator would advise you to group objects which are similar together as this is visually appealing. The same principle should be applied to plants and ponds. A group of marigolds should be planted together near the edge of the pond, rather than planting them individually in different locations. You will also want to take into consideration the amount of sunlight your plants receive. Different species will need different amounts, and they must also be planted at the proper depth. Plants that need complete sunlight should be placed in a location where they will receive 6 hours of direct light that is not obstructed by any object which puts them in shade. Before you begin selecting and adding plants to your pond, it would be prudent to learn about them. You can get information from websites, blogs, and videos or by speaking with someone at a nearby garden center. Learning as much as possible about the plants will make it easier to care for and maintain them. The most beautiful ponds are those which have a diverse combination of aquatic plants. Water lilies or a lotus could be planted near the edge of the pond, and you could also add plants which float such as water lettuce. Submerged plants should be added as well since they will provide oxygen to the pond. Variety is the most important thing to look for when selecting and adding plants so be sure to experiment. For smaller ponds you could utilize tall plants near the sides of waterfalls, which will frame them in a manner that creates a stunning view. Larger ponds provide even more options for placement so don’t be afraid to experiment and find an arrangement that works for you!